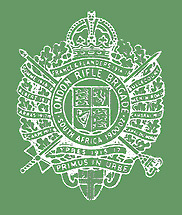 The London Rifle Brigade, popularly known as the LRB, was formed as the 1st London Rifle Volunteer Corps in 1859 and within a short time consisted of fifteen companies. In 1908 the 1st Londons became the 5th (City of London) Battalion, The London Regiment (London Rifle Brigade) and as such served throughout France and Belgium during the First World War. One member of the battalion gained the Victoria Cross south of Wieltje, St Julien Road on 13 May 1915. In 1937 the battalion left the London Regiment and was designated as The London Rifle Brigade, The Rifle Brigade (Prince Consort’s Own). The battalion was divided as 1st and 2nd LRB in 1939. The 1st became a motorised unit and in 1941 was redesignated as the 7th Battalion, Rifle Brigade. After serving in Egypt, Libya and N Africa, the 7th became a lorried infantry battalion while serving in Italy during 1944. Formed in 1939, the 2nd LRB later became the 8th Battalion, Rifle Brigade and served in NW Europe throughout 1944-5. The title, London Rifle Brigade, The Rifle Brigade was once again assumed in 1947, when the 7th and 8th Battalions were merged. In 1950 a new title, ‘London Rifle Brigade/Rangers’, was adopted upon amalgamation that year with the Rangers. This battalion is now represented by part of the 4th (Volunteer) Battalion, Royal Green Jackets.